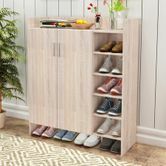 Made of high-quality particle board with melamine, the shoe cupboard is sturdy and durable. 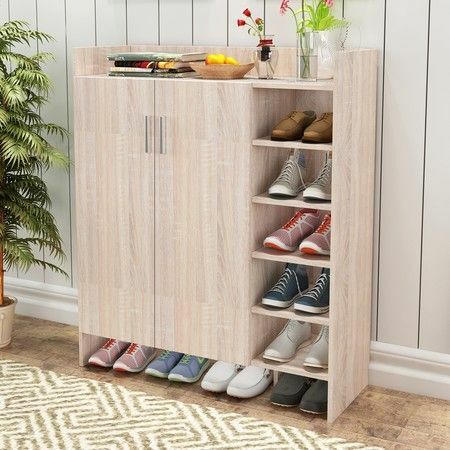 With 2 doors cupboard for hiding and protecting the shoe, the interior fixed shelves and side storage fixed shelves could store up to 21 pairs of shoes. And its desktop is designed for receiving some items, like a briefcase, keys, purse, etc. It is good to fit the entrance hall, closet or foyer for easy access. Get one and say goodbye to the messy shoes on the floor today! W83 x D30 x H96cm approx. 111.5 x 39 x 23cm approx. Items are just as described easy to assemble.